Dental amalgam is a dental filling material with which concerns have been raised because it contains mercury. Amalgam is a combination of metals that has been a popular and effective filling material used in dentistry for the last 150 years. It is sometimes called "silver amalgam,” but it is actually a combination of metals including silver, mercury, tin and copper. Tooth-colored materials now can be used to restore teeth and amalgam is used less often than in the past. The newer materials can't be used for all situations though. Millions of people have amalgam fillings. Concern has been raised over the mercury in amalgam and many studies have been done on the safety of amalgam fillings. Why is mercury used in amalgam? Mercury is used in amalgam because it helps make the filling material soft so it can be mixed and pressed into the tooth. It hardens quickly and can withstand the forces of biting and chewing. Around a half of a dental amalgam filling is liquid mercury and the other half is a powdered alloy of silver, tin, and copper. It is used to bind the alloy particles together into a strong, durable, and solid filling. Why the concern about mercury in amalgam? Everyone is exposed to mercury through air, drinking water, soil and food, like fish, and the concern is that from all sources it builds up in body organs. The harm caused by mercury in the body is related to the amount. Very low levels apparently don't cause any problem but at higher levels, symptoms can include anxiety, irritability, memory loss, headaches and fatigue. It is controversial because of the possibility that mercury is released from the fillings and absorbed in to the body. It was thought that no mercury was released once the filling was placed in the tooth, but more recently it has been found that small amounts of mercury in the form of vapor can be released as the amalgam filling wears. The amount of mercury released from amalgam in the mouth is thought to be very low, and is said to be less than the amount that most people are exposed to in the environment or in food. Mercury is a poisonous, non-radioactive, and naturally occurring substance and there is no debate about the toxicity of mercury and every knowledgeable scientist and health professional understands this. The World Health Organization (WHO) has stated that there is no safe level of mercury. Mercury is stored in every cell of the body, of which there are trillions of cells, and it accumulates in the body. When amalgam fillings are removed at the dentist, the pieces that are removed from a tooth are caught in a trap and must be placed in a hazardous waste container, and stored under water in an air tight manner. Mercury crosses the placenta and amalgam fillings are not to replaced in pregnant women. Do some people have reactions to amalgam? In rare cases, people have allergic reactions to the mercury in amalgam, with less than 100 cases reported. Should pregnant women be concerned about amalgam fillings? Mercury can cross the placenta, and pregnant women are asked to avoid unnecessary dental care. Women should not get amalgam fillings during pregnancy, or have them removed, and require alternative filling materials. Should anyone else consider alternatives to amalgam fillings? Concerns about mercury exposure are due to the total amount of mercury absorbed from all sources. For breastfeeding mothers, the Food and Drug Administration (FDA) in America has state that the amount of mercury in breast milk from dental amalgam is low and falls well general levels for oral intake that the Environmental Protection Agency (EPA) considers safe. There is LIMITED CLINICAL INFORMATION, and the conclusion is that the risk information is that infants are not at risk for adverse health effects from the mercury in breast milk of women exposed to mercury vapor from dental amalgam. Due to this ambiguity, amalgam restorations are not an acceptable dental material for mothers who are breast feeding, as a precautionary measure. Children under the age of 6 are unable to have amalgam fillings placed, due to health risks. As a precautionary method, amalgams are not recommended for any children by our dentists. If amalgam is safe, why does my dentist take precautions when handling it? Dentists work with mercury almost every day, so they take safety precautions so that they don't inhale mercury vapours that might produce symptoms of mercury toxicity. If you are getting an amalgam filling or having one removed, your dentist will use high-powered suction to remove any excess amalgam from your mouth. Are there alternatives to amalgam? Dentists use other materials to restore teeth. These include composite resin, porcelain and gold. Amalgam is stronger than composite resin and requires less time in the dentist's chair. Composite resin is a tooth-colored material but it wears faster than amalgam and can't be used in every situation, only in smaller restorations, because it is not as strong as the tooth structure. Porcelain does not react in the mouth - it doesn’t corrode or absorb bacteria - is stronger than tooth structure, and bonded into cavities for a long lasting restoration that looks just like the tooth. Amalgam fillings usually last a long time, but they corrode - break down - and tarnish eventually. They can also cause the tooth to crack away from around it, because with hot and cold foods and drinks, it expands more than the tooth that holds it in the cavity. Over time, and under the pressure of the bite, which can be harder than 100kg, pieces of tooth may crack off and make the rest of the tooth weak - sometimes to the point that the cracks reaches the nerve of the tooth, and it dies, or cracks through the root meaning the tooth has to be removed. If there is enough tooth left and no damage of the nerve or root, then porcelain can be computer designed and bonded into the damaged area. Amalgams can also set up electrical currents - called galvanic reaction - in the mouth between different metals in fillings. Ideally fillings should be inert - meaning they should not have any reaction in the mouth and be resistant to corroding and causing other reactions in the mouth. Mercury based metals obviously do not meet these criteria. You should replace amalgam fillings when they are worn, broken or when there is decay beneath the filling of course. Porcelain is a material that is harder than tooth structure and designed on a computer, then cemented into the cavity. With good care and reviewing at check up time each 6 months, they can last a very long time. What are the problems that can happen if a deep amalgam filling is removed? 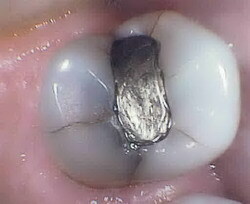 Sometimes removing a deep amalgam can be problematic. Underneath amalgams, a lot of the time there is a powdery base cause Kalzogen - which was an oil of cloves based sedative - but is not compatible with modern day bonding. It was used to cover very deep damage to try to keep a tooth settled. Sometimes we find damaged underneath this, or cracks under the fillings which have caused damage to the nerve, meaning the tooth has to be root treated prior to any further work on the tooth. It must be a healthy tooth inside to be able to keep it for the long term. Amalgam is a metal so only the outline of the whole filling can be seen on an x-ray. It is usually impossible to see what is sitting inside the tooth if the filling is very big and sits on the sides of the teeth, because it looks like a white blob with no detail about the edges of the tooth visible. What are the exact facts and issues with dental amalgam fillings? With temperature amalgam expands twice as much as enamel and dentine. Amalgam transmits temperature 20 times faster than composite resins, so they expand and contract much more causing size change in a cycle which causes the tooth to fatigue and cracks to occur. The mouth is a corrosive environment, which means amalgam is unstable and continues to react for many years. Corrosion and changes in size never stop, and corrosion causes lateral stress on cavity walls because corrosion products occupy a larger volume. The corrosion and release of metals from the fillings is supposed to give a ‘protective’ function which closes micro gaps, and stops some bacteria growing. However there is a high incidence of bacteria penetrating into the inside of the teeth under fillings that seems to be intact, and most of these fillings show bacteria is leaking into the tooth. Amalgam deforms under pressure and loading, which creates extra lateral stress on the thin tooth on the sides of the filling. When the filling is pressed into the tooth the cusps deform and bend out, and the setting reaction expands a bit, causing extra stress. Often dentists are seeing vertical fractures at the edges of the tooth around the fillings. The cusps of the tooth can not move unless something breaks, and slight expansion of the amalgam can cause high stresses, especially if the filling is wide. The cracks can allow bacteria to enter in to the tooth and cause decay. Composite resin is a better material for restorations that are needed on the biting surfaces of the teeth because it bonds to the tooth and acts like the tooth. For small cavities composite resin is adequate for restoration. For a larger cavity, the placement of composite resin in between the teeth is challenging for dentists, because the resin shrinks a very tiny bit when it is set with the blue light. There is a slightly higher success rate for amalgam fillings in these areas. A second episode of decay is seen more after the composite resin fillings have been there for 5-8 years. Amalgam causes typical fracturing at the edges of the teeth, generally known as “ditching”, and corrosion can cause them to turn blackish and stain inside the tooth. It is harder for a dentist to evaluate a second problem with decay around an amalgam filling, because the amalgam corrodes and stains the tooth around the filling a grey shade, and decay is usually evaluated according to a shadow of grey or brown. Amalgams also show up as an outline of the whole filling on an x-ray which can prevent a dentist being able to diagnose a second issue around the filling without removing it. Amalgam has served dentistry well, and overall, amalgam restorations have good durability and are the least technique sensitive fillings that dentists can place. Technology now provides porcelain inlays and inlays, which are designed with a computer and made out of pressed ceramic. These do not corrode or break down, are not porous, look like the tooth, and are long lasting. The latest advances in this technology, now make them the best way to replace amalgam restorations. If the restoration is very small, composite resin is adequate.